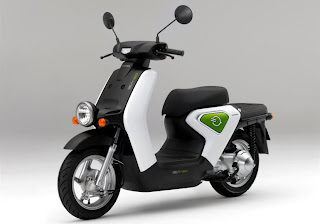 Honda Motor Co., Ltd. announced that it will start lease sales of the EV-neo electric scooter on Friday, December 24, 2010. The EV-neo is an electric scooter developed for businesses such as transport of heavy goods or delivery services and which delivers a clean and quiet ride without compromising powerfulness. The vehicle qualifies as a first-class motor-driven cycle in Japan, for engine displacements of 50cc or less. Honda plans to deliver about 100 monitoring vehicles between December 2010 and March 2011 to cooperating businesses in the monitoring program*1 for collecting riding data and other useful information and to start lease sales of the EV-neo to general businesses and individual business owners in April 2011. The wide range of data collected from actual business use together with the data obtained from test operations*2 of 10 prototype vehicles, conducted since October 2010, is expected to be used in future development of electric scooters and motorcycles. On top of the excellent environmental performance offering a clean and quiet ride worthy of an electric scooter with zero CO2 emissions while riding, the EV-neo leverages a motor that, even with cargo loaded, generates high torque even in the low-speed range to achieve a powerful starting and hill-climbing performance. An in-house manufactured motor and a lithium-ion battery that apply Insight technology have been adopted, and an exclusively developed quick charger enabling full recharge in 30 minutes in a 25°C environment allows charging to be conducted at convenient intervals during the working day. The EV-neo has been developed as a complete electric scooter that can be used in a wide variety of business situations. A body design, which features a wide and flat loading space that enables easy loading, and a flat floor that makes it easy to get on and off the vehicle, ensures ease of use in delivery services and other business situations. The EV-neo PRO, which is based on the EV-neo and will be put on sale simultaneously, adds a large rear carrier that is convenient for delivery of newspapers and other items, and a standard-equipment bracket that can further enhance load capacity by attaching a basket in front. By offering products with outstanding environmental performance to more customers, Honda is committed to advancing its contribution to reducing CO2 emissions on a global scale.